What is the Ring Floodlight Cam? Regardless of where you live home security is always a worry. With the never-ending gadgets, big screen TVs, games consoles and tablets that the modern home now has, they are an increasing target for the dark side. There are many solutions now available to ensure your home is secure and that you can keep a close eye on it at all times, ranging from £50 IP cameras to fully monitored CCTV systems costing many thousands of pounds. One company that is at the forefront of this is Ring. Back in July of last year we reviewed their excellent Ring Video Doorbell, then in October their even better Ring Video Doorbell 2 which allowed you to see exactly who was at your door, even if they didn’t ring the doorbell and gave you the ability to speak to them if you needed to wherever you were in the world. ‘Sorry mate I can’t take that parcel as I’m stuck on the toilet, can you leave it with next door?’, for example, even though you may have been thousands of miles away on holiday. 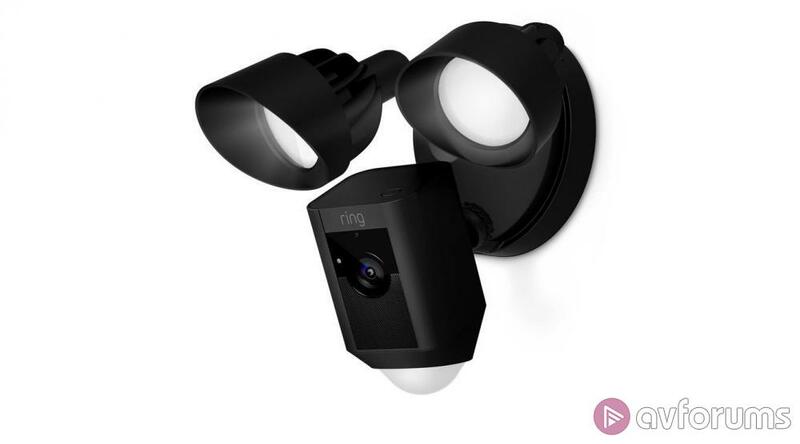 Our next review item is again from Ring, now they’ve nailed down the front of the house security, the back of the house gets some much-needed attention in the guise of their £249 Ring Floodlight Cam. 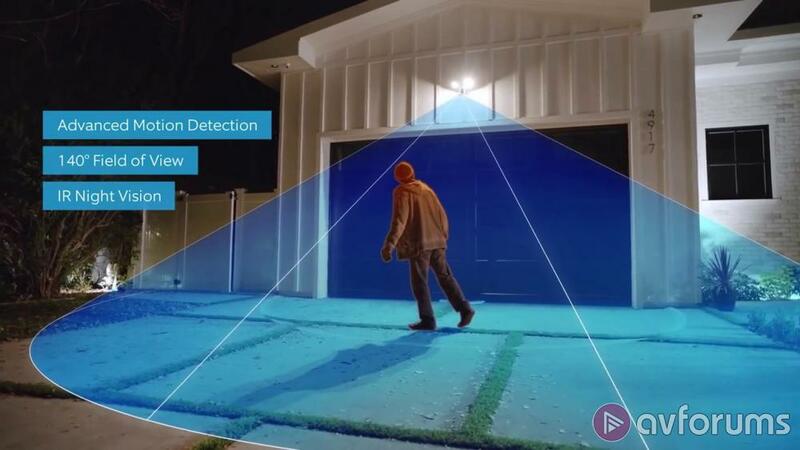 Claiming to be the world’s only (probably not for that much longer we would assume) motion-activated HD security camera with built-in floodlights, a siren alarm and two-way talk, can it build on the success of the Video Doorbell? Read on to see how it fares in our tests…..
With an RRP of £249, but widely available for £199, the Ring Floodlight Cam includes everything that is required to install it. Keeping the same theme as we saw with both Video Doorbell’s, the unit arrives nicely packaged with all the tools and fixings you will need together with the wall mounting bracket. However, unless you already happen to be a qualified electrician, the Floodlight cam does require professional installation unfortunately. Available in black or white, the unit has a sleek and modern design with the camera unit in the centre and a floodlight either side. It’s a fairly large unit as the camera module also contains a 110-decibel siren. The baseplate measures 12cm in diameter. Whether you choose black or white is of course up to you, personally we would rather have the stealthier black as it won’t stand out as much, but if you are looking for an obvious and noticeable deterrent then white would be the one to go for. The build quality is impressive with the whole unit having that high-end feel to it. The camera is Full HD 1080P with a 140° field of view. It includes night vision and motion detection together with two-way audio, presumably so if you see an intruder you can shout at them to ‘get off my land’ – in a West Country accent of course. The two floodlights have a soft white glow and are 3000° kelvin with a 270° field of view. The Wi-Fi is 802.11 b/g/n at 2.4Ghz only. It is of course weather resistant and can operate between -28°C to 48°C, so unless something drastically changes in the UK in the next few years should cover our normal temperatures! The physical installation will unfortunately require the services of a professional. Unless of course you happen to be a qualified Electrician, in which case it’s happy days, but as most people aren’t and shouldn’t be let near electrics, you will require a professional. As mentioned above everything the electrician needs to install the Floodlight Cam is provided in the box. That is only everything from the Floodlight end of the installation, cabling and a switch box from your mains to the Floodlight you will have to supply. The mounts of the camera and both lights are fully adjustable to get the exact angle and coverage you require. Whilst it is still not recommended unless you are a qualified electrician, if you happen to already have an external floodlight, it should be reasonably easy to replace that with the new Ring Floodlight Cam. Just remember to turn the power off first as we won’t hear from you if you don’t. Once the unit has been installed and connected to the power supply, the final steps can be easily carried out by a non-professional. The Ring app, available on iOS, Google Play, Mac and Windows, is required to continue the installation and setup the unit. The app is very easy to use with a clean and well laid out user interface. 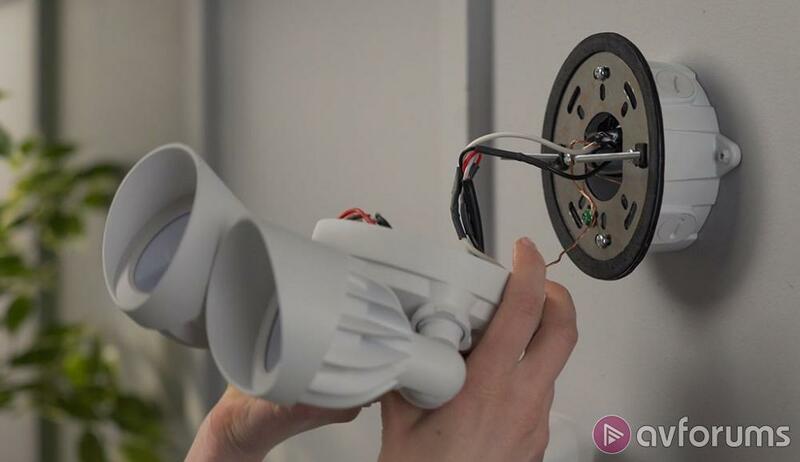 You simply follow the instructions to connect the Floodlight Cam to either your Wi-Fi or to the optional Chime Pro, which takes just a few minutes and then the Floodlight is ready for use. Within the app you will find an event history, device health, linked chimes and the motion and light settings. Within the motion settings you have motion zones which allows you to draw an area on the camera’s current view where you want motion to be detected from. It’s highly configurable so you should be able to get the exact shape and motion detection coverage that you want. A motion schedule can also be set up if you want it disabling at a certain time and day. This can be any day or several days and even just a 15-minute window if that’s all you need. Finally, the motion sensitivity can be tweaked from all motion to just people only. The light settings option contains a separate motion zone which is independent of the camera’s motion detection. This can alter the degree and distance of when the lights come on. You can also disable them completely but this appeared to not work as whenever motion was detected the lights would still activate regardless of this setting. You can also set up a schedule if you want the lights to be permanently on for a certain time of day or night. The lights can also be manually turned on and off from the main app window. 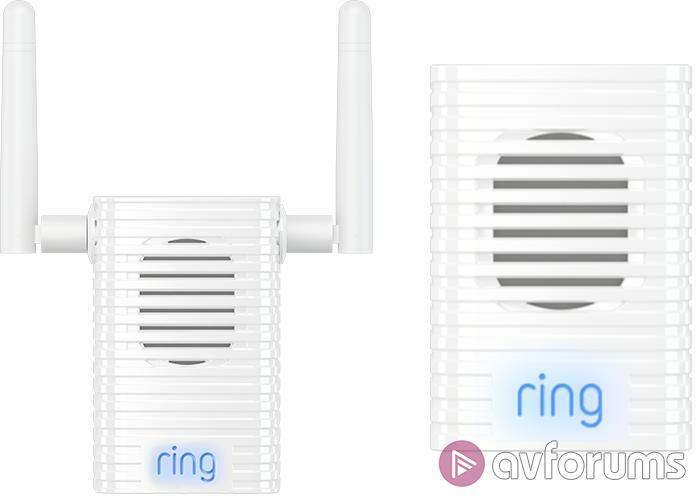 Whilst we found the Ring Video Doorbell and Doorbell 2 to both be overall excellent units, a strong Wi-Fi or Chime Pro signal was very important. If there was a weak signal where the doorbell was located, we often found trouble connecting and when it did it would take a long time and often videos were not recorded properly. Here with the Floodlight Cam as it is outside of the property and likely to be on the fringe of a Wi-Fi signal we did have concerns that it just wouldn’t work at all. Thankfully it appears Ring have fitted a slightly stronger Wi-Fi unit in the Floodlight Cam, but not by much! Despite the Ring app protesting that the signal to the Floodlight Cam was weak as it is on the fringes of our Wi-Fi network, all motion detection notifications were received instantly. A strong Wi-Fi signal or Chime Pro signal is still highly recommended though as on quite a few occasions the recorded videos would either suffer from heavy pixelation or breakup and even just a completely black screen on the video. Audio was still recorded but it appeared the network connection was too weak to send the video part of the recording. As for the quality of the videos themselves, at 1080P Full HD we expected a high-quality image with plenty of detail and on the most part that’s what we got, providing the network connection was strong enough of course. Faces were easy to identify and the image was clear and bright. The audio part of the recording was acceptable, although prone to minor wind noise due to where we had it installed. 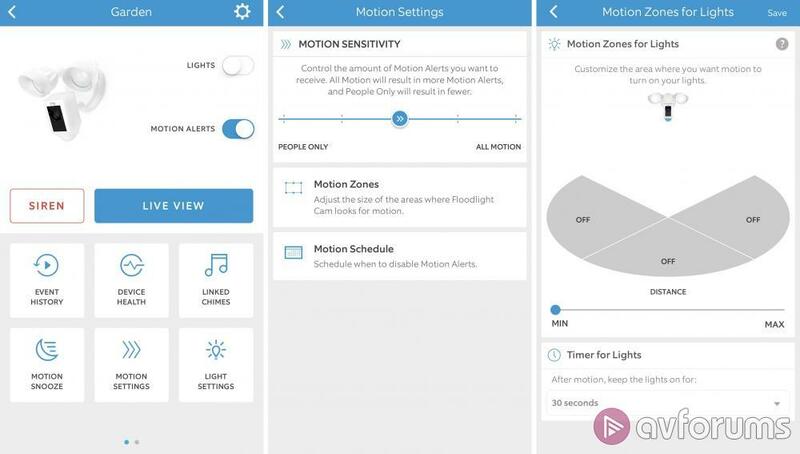 When motion is detected you immediately get a notification on your Smartphone and even Smart Watch, clicking the notification on your Smartphone will open the App and then start playing the video. If you don’t see the notification immediately, the video will be in the event history to playback and see what triggered the motion. If you do connect immediately, you can either dismiss it if it’s your cats having their daily mad hour, or should it actually be something unpleasant you can activate the siren and even shout at the intruder to get them to clear off. Activating the siren does require confirmation so don't be concerned that you might accidentally set it off when using the app. One of the only real negatives we found with the Ring Doorbell and the Chime Pro is that if there has been a power cut, it won’t always connect back to the network. Unfortunately, this is the same with the Floodlight Cam, it appears intermittent in that most of the time it will be ok, but for some reason sometimes it will just forget the connection and you will have to run through the setup again. Bear this in mind if as suggested in the installation instructions you fit the unit 3mtrs high. Getting the ladder out in the pouring rain just to press one button on the top of the camera isn’t the most pleasant of tasks. The Floodlight Cam comes with a 30-day free trial of Ring’s cloud storage and video recording service. Once this free trial has expired, to continue to have the videos recorded and accessible, you will need to purchase a subscription. There are two options for this Cloud Service, the first is the Basic service which is £24.99 per year or £2.50 a month and this is per camera, which gives you all the Cloud features. The second is the Protect service at £80 per year which covers unlimited cameras and includes a lifetime warranty (including damage) and 10% discount on purchases at Ring.com. You are also able to log in directly to your account on the Ring website and review the videos and events stored there. If you choose not to pay for the Cloud service, you will still receive notifications and can access the live view, the videos will just not be recorded. If you do have an issue with the strength of your Wi-Fi signal where the Floodlight Cam is located, then the Chime Pro accessory is a likely candidate to solve that problem. Available for around £40 the Chime Pro acts as a Wi-Fi extender and indoor chime. This should ensure you have a strong signal to the Floodlight Cam to remove any issues of late notifications or video recording problems. Unfortunately the extended Wi-Fi network is hidden and only works with Ring devices. 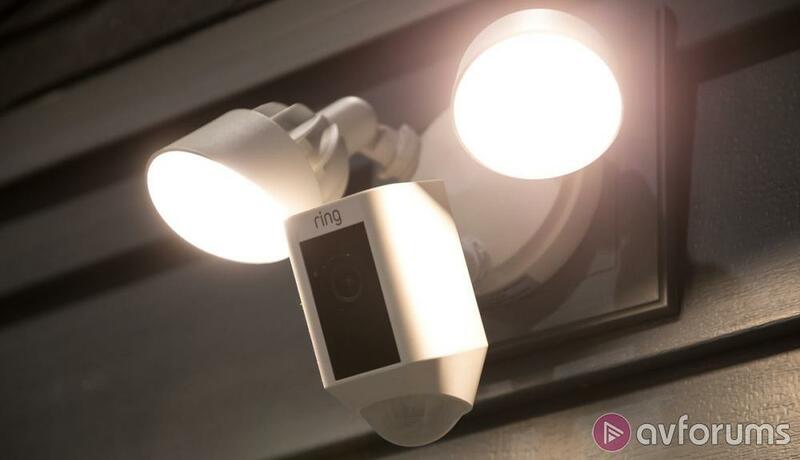 With an RRP of £249 and widely available for £199, we found the Floodlight Cam to be another high-quality product from Ring, building on the excellent results we had with both the Video Doorbell and Video Doorbell 2. It has an impressive array of features such as the twin floodlights, Full HD 1080P video, night vision, two-way talk and a 110 decibel siren. Coupled with the very easy to use app which provided instant notifications should any motion be detected. A couple of negatives have started to creep in and one of these is the issues you have when the Wi-Fi signal is too weak. We achieved reasonable results with our installation which only has a weak Wi-Fi signal, but video breakup and non-recording issues were present occasionally, so a strong Wi-Fi signal is highly recommended. The other negative is failure to reconnect to the network following a power cut. This was a minor annoyance with the Video Doorbell but if you have the Floodlight Cam fitted high up it could become a major pain to get the ladder out just to press a button on the unit to set it up again. Those two negatives do not thankfully detract too much from what is an overall excellent product and at £199 Ring offer an impressive package with the Floodlight Cam. An excellent array of features and a well-developed app also help to ensure that this is worthy of an AVForums Recommended award. We would have rated it higher if they could sort out the Wi-Fi signal and reconnection issues. Write your Ring Floodlight Cam Smart Home Product review.